German & Russian | Alyssa Howards, Ph.D.
Alyssa Howards received her Ph.D. from Washington University in St. Louis in 2003 and joined the German and Russian Department at Wake Forest that same year. She has spent several years living in Germany and Austria, in every possible guise: a surly eighth-grader living with her family in Saarbruecken, a junior-year abroad student in Braunschweig, a Fulbright teaching assistant in Bremen, a DAAD scholarship recipient in Muenster, and as faculty resident director of WFU’s Flow House in Vienna in the Fall of 2010. Her research interests focus on the last half of the nineteenth century, particularly on the intersections between folklore, historiography, and realist literature. Related to this interest, she has presented and published papers on Gustav Freytag, Adalbert Stifter and Gerhart Hauptmann. Further afield from Europe, she is interested in the representations of the American frontier in both German and American literature. 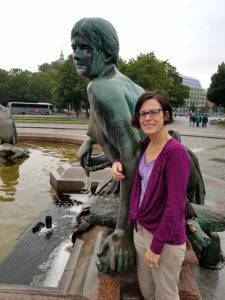 She is also an active member of the North Carolina chapter of the American Association of Teachers of German, and regularly presents papers at teaching conferences. When not racing around the department looking for her lost keys, Alyssa is most likely running up and, more happily, down the hills of her rural neighborhood.